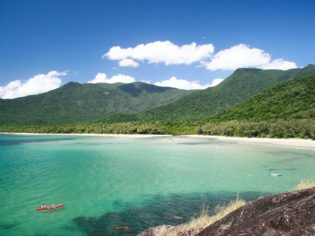 The words “unique” or “paradise” are often used to describe many destinations the world over, however, no other place truly encompasses these words better than the Daintree Rainforest, especially if you’re up for a kayak adventure, says guest blogger Matt Isabella. Located 120 km north of Cairns along one of the world’s most amazing coastal drives, the Daintree Rainforest is the oldest living rainforest in the world. It is also happens to be the only place on earth where two world heritage spots meet: The Great Barrier Reef and the Daintree Rainforest. The area is home to over 1800 individual plant species and one third of Australia’s mammal species. Coupled with pristine beaches, freshwater swimming holes and breathtaking walks there is no other destination that rivals or compares to this oasis. This is the first in a series of blogs exploring the many facets of this area, home to more than 1800 individual plant species and one third of Australia’s mammal species. Couple these with pristine beaches, freshwater swimming holes and breathtaking walks and you begin to see why there is no other destination that rivals this oasis. With activities such as swinging in the jungle, reef trips, river cruises and a plethora of others, the Daintree caters for people from all walks of life. The decision to come here also brings with it a chance to disconnect from the world around. With no mobile service or any real internet coverage, the chance to connect with your partner, friends or family is an opportunity in itself. Sunbathing on a private beach or a romantic dinner under a star-spangled sky are just a couple of the wonders that await the intrepid traveller, seriously great locations include Cape Tribulation and Myall Beach. The adventurous traveller, for example, may wish to try the kayaking tour that departs daily from Cape Tribulation Beach House. What makes a paddle with Paddletrek Kayak Adventures stand from other kayak trips in Australia is the location. You can choose from a three-hour morning adventure or the two-hour sunset paddle. For the more experienced kayaker, Paddletrek offers a trip to the uninhabited Snapper Island. Stunning scenery awaits with the rainforest-covered mountains and palm-fringed beaches. 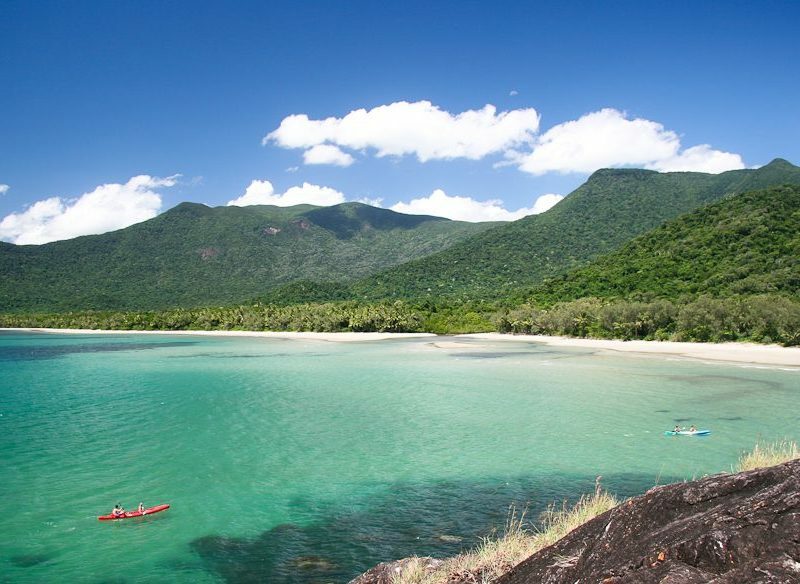 Discover the secret forest of Myall Beach and explore the mangroves of Cape Tribulation Bay. Turtles, dugongs and stingrays are some of the locals that greet you on these tours. Kayakers on this tour often see a pair of sea eagles that have been partnered for over 20 years. Watch them hunt, build their nest and teach their hatchlings to fly. Challenge yourself when it is a bit windy and surf some waves. On a calm day, simply relax and enjoy just floating on the ocean watching the sun setting behind Mount Sorrow. Family-run Paddletrek, like many tours in this region, are locally owned, some of which have been around for more than 20 years. The knowledge and passion of these people truly shines through. There is no better way to experience the connection between the Daintree Rainforest and the Great Barrier Reef whilst coming away with a better idea of how our ecosystem works. I look forward to taking you on a journey through this paradise that I call home on this series of blogs. The Daintree Rainforest is calling you all you need to do is answer the call. Welcome to the Daintree Rainforest.